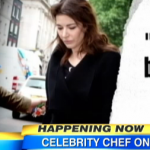 Dan was on Good Morning America this morning to discuss the latest on celebrity chef, Nigella Lawson, who is in the midst of a fraud trial regarding two former assistants. The former aides, Italian sisters Francesca and Elisabetta Grillo, are accused of embezzling hundreds of thousands of pounds on company credit cards while employed by Lawson and her then husband, Charles Saatchi. Lawson took the stand as a prosecution witness today, and although her former assistants are on trial, Lawson feels like she is on the defense because of illegal drug use allegations made against her. Defense lawyers have claimed Lawson used illegal drugs, including cocaine, citing an email from Saatchi. They have suggested Lawson turned a blind eye to the Grillos’ lavish expenditure in return for them keeping quiet about her drug use. Lawson is fiercely denying these accusations. How much of a role does this play in the trial? Says Dan, ” You can understand why she feels like she is on trial here. The defense is, in effect, “We were given permission to use these cards, in part, because she was on drugs… we were working particularly long hours, because she was on drugs”, so that becomes a crucial part of the defense here, so if these jurors don’t believe she was abusing drugs than I think this case is over, if they do, it still doesn’t mean they’re getting off.” Watch the full clip here.